Return to the Planet of the Apes is an animated television series that was produced by DePatie-Freleng Enterprises and 20th Century Fox. The series aired in 1975 on Saturday mornings on NBC and consists of 13 half hour episodes. Return to the Planet of the Apes suffers a great deal due to its insanely low budget. The end result is a series that is a bit of a mixed bag. Starting with the animation itself, this is where the tight budget is at its most obvious. There are a number of shots that are literally camera pans across a single piece of art. In addition to this, the small amount of actual animation we do get tends to be mercilessly reused, as are a number of the still pans. The overall effect ends up being one of watching a televised comic book. Ironically, the Star Trek animated series from two years earlier features a great deal more action in the production. On the plus side, the art is by Doug Wildey. He is the man responsible for the work on what is easily my all-time favorite animated series, the classic 1964 Jonny Quest. 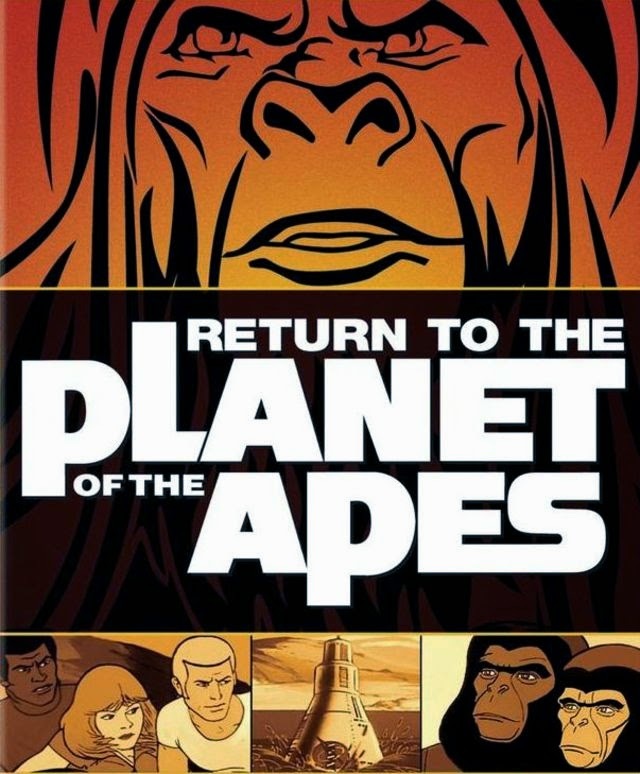 In fact, in an interview, Wildey said that the title sequence of Return to the Planet of the Apes was more of what he would have preferred for Jonny Quest, as he designed Quest's title sequence for the original show, which was an animated series based upon the popular radio character Jack Armstrong. Being a fan of his artwork, I was not as put off with the more static artwork, which actually does get a little more dynamic later in the series. While other reviewers have been less than generous with regard to the voice acting, I would describe it as serviceable. I also found that the voice acting tends to vary, largely based upon the characters, with Zira and Cornelius easily being the best of the cast. The strongest element of Return is the writing, which is again a bit of a mixed bag early on, as a lot of the initial concepts are things that we have seen in the first two original Planet of the Apes films. The story follows three astronauts - Bill Hudson, Jeff Allen and Judy Franklin - as they go through the then standard time warp and land on Earth after the fall of mankind and rise of the apes. One interesting change is that the apes' civilisation is much more advanced than in the movies, with the apes having access to internal combustion engines and television. This was the original concept for the first Planet of the Apes film, but it was ultimately dropped due to budget constraints. In addition to the standard, largely speechless human population, the series also features a group of human 'underdwellers', clearly inspired by the mutated humans from Beneath the Planet of the Apes. After the exposition, the story ultimately heads off in its own unique direction after about five episodes. One aspect that surprised me was that the series is largely one continuous story, which I didn't notice when I originally watched it back in the day. This was probably caused by my irregular viewing of the series at the time. This was quite ahead of its time as television, especially Saturday morning kid's fare, which was largely episodic during that period. The only other example like this that I can recall is four years later with the Filmation Flash Gordon animated series. Return begins with the somewhat standard opening of our crew crashing on Earth in the far future in a barren wasteland. While searching for any signs of civilisation, Judy disappears into a fissure in the ground that we later learn was an illusion created by the Underdwellers as a means of capturing her. Bill and Jeff find the humans, including Nova, who seems to be the only one capable of any speech, and a fairly low level at that. Bill gets captured by an ape human-hunting expedition and is taken to Ape City (yes, it is really called that). He eventually escapes with the help of the chimpanzee scientists Zira and Cornelius. 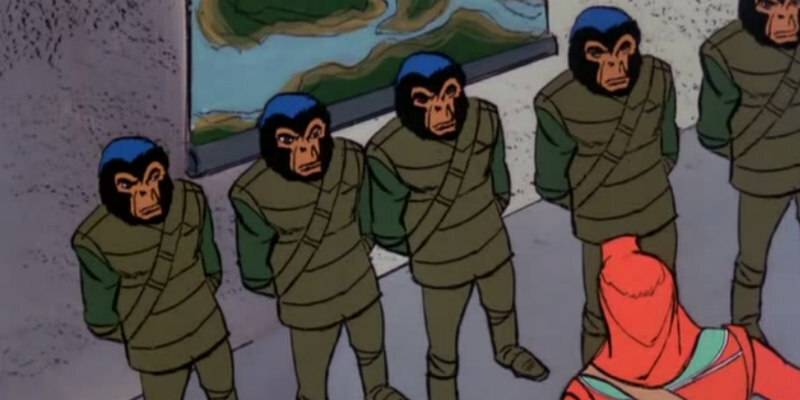 After this, the main focus of Return's story is the attempt by the three astronauts to move the humans far enough away from the ape city to avoid the relentless pursuit of the ape military leader General Urko. They do this with continuing assistance from Cornelius and Zira, who are themselves having to keep their actions hidden from the watchful eyes of Dr. Zaius. Within this story are a number of subplots, which include some surprisingly adult concepts like Urko's desire to launch a military coup against Zaius' current regime. There is also an ape monastery that shows up a couple of times, which was a unique new addition for the series. Unfortunately, the weak animation does occasionally hinder the story. There was a risky balloon flight early on, where Bill and Cornelius get caught in a storm, which is supposed to be a frightening sequence, but thanks to the lackluster animation is quite the opposite. Thankfully, these low points of animation do become less frequent as the series progresses. However, even with all the negatives working against it, I have to say I did find the story engaging enough to hold my interest throughout the series.